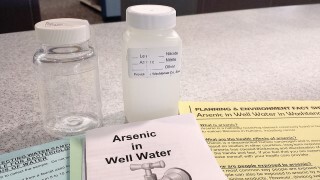 Did you know that here in Cumberland County, more than 17 percent of wells are estimated to contain dangerously high levels of arsenic? Or, that statewide, roughly 100,000 people have arsenic in their drinking water at levels above the federal safety standard? I believe that in today’s world, with all the technological advances at our disposal, there’s no good reason that a single Mainer should have hazardous toxins flowing out of their faucet when they turn on the tap. That’s why I was pleased to support legislation, now a law that allocates additional funding to promote and ensure affordable, safe drinking water. The EPA calls arsenic one of the most dangerous toxins on earth. This poison is linked with bladder, skin and lung cancer. It’s particularly dangerous for children, whose brain development can suffer when exposed to arsenic over time. Technology allows us to treat contaminated water, filtering out arsenic and other toxins before the water ends up in our saucepans or drinking glasses. But the cost can be prohibitive for some families. Home treatment systems can cost between $1,200 and $3,000, and high levels of contamination require even more costly filtration, with installation running as high as $12,000. For many families, that price tag puts safe drinking water out of reach. But the high-cost of treatment systems isn’t the only barrier. Despite the shocking rate of contamination, many Mainers are unaware that their wells are even at risk. Fewer than half of well owners in Maine have tested their water supplies. Testing is the first step to guarantee clean water, but it’s a step that far too few of us are taking. That’s what makes the bill we passed this year such a good policy. It allocates $500,000 to the Maine State Housing Authority to help eligible low-income families treat their contaminated water. And it allows the Authority to use some of that new money to fund public education efforts that will help spread awareness of the risk posed by arsenic, and the resources available to help. Even though the bill addresses the financial needs of low-income families, contaminated water affects the health of families from all income levels and if you use well water please have it tested as soon as possible. If you need help contact the Maine Housing Authority. The Authority has helped eligible low-income families treat their contaminated well water for years, but before this bill was enacted, its funding was running low. It had only enough money to assist about 200 households with water treatment. We know there are far more than that who need help. The Legislature passed the bill in July, but Gov. Paul LePage vetoed it in August. Budgets are always tough, and there’s never enough money to do everything we might like. But protecting Maine children from toxins in their homes must be a priority. No one in our state should suffer the effects of poison in their drinking water simply because their families can’t afford the expensive systems needed to make their water safe. I’m pleased to report that my colleagues in the Legislature agreed with me. On August 2, overwhelming bipartisan majorities voted to overturn the governor’s veto and pass the new water treatment bill into law despite his objections. Now the bill will become law, and the funding for the Authority will be made available on November 1. I urge you to test your well if you haven’t already done so. You can visit www.maine.gov/dhhs/mecdc/environmental-health/eohp/wells/mewellwater.htm for information about how to test, or visit mainehousing.org for info on financial assistance for arsenic abatement. I’d also be happy to help you navigate the process. As always, feel free to contact me at diamondhollyd@aol.com or (207) 287-1515, with any questions or concerns about this or any other important issue facing our state.